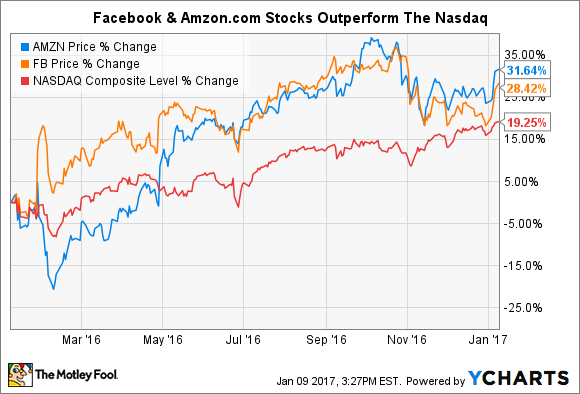 Better Buy: Amazon.com, Inc. vs. Facebook, Inc.
We put Facebook and Amazon through a 3-part investing gauntlet to determine which stock looks like the better buy today. Though they don't compete head-to-head (for now), social networking dynamo Facebook (NASDAQ:FB) and e-commerce leader Amazon.com (NASDAQ:AMZN) are two of the most successful companies in tech today. Now, as their market capitalizations each sit near $400 billion, Facebook and Amazon shares have once again shown that their days as growth companies remain far from over. For all their successes, though, it isn't immediately clear whether Amazon or Facebook is the better buy today. In this article, we will put Amazon and Facebook shares through a 3-part investing gauntlet to determine which company is the more compelling stock. The differences in Amazon and Facebook's business models manifest themselves here. In comparing the two, Facebook simply trounces Amazon in all but one liquidity measurement. Like Alphabet, Facebook's lucrative advertising platform provides it with plenty of excess cash, largely negating the need for the company to take on debt to fund its operations. On the other hand, the fixed asset nature of Amazon's e-commerce business requires the company to employ a responsible amount of leverage in its capital structure. Speaking to their different margin structures, Amazon's revenue base is roughly four-time as large as Facebook's. So though Amazon's financial footing is indeed sound, Facebook easily wins the comparison of financial fortitude. As the leaders in their respective markets, it's fair to say that both Facebook and Amazon.com each enjoy durable competitive advantages, albeit of very different sorts. Amazon derives its competitive moat from two distinct sources. First, Amazon's leadership position in e-commerce gives the company meaningful leverage over its suppliers -- remember its heated dispute with book publishers like Hachette? -- which translates into lower prices. Second, Amazon's uniquely entrepreneurial culture -- Jeff Bezos describes it as "the best place in the world to fail' -- allows it to constantly reinvent and improve its business model. It's this kind of thinking that allowed Amazon to create AWS, and it's this same spirit that could see Amazon disrupt the global logistics business as well. Amazon's uncanny ability to find ways to lower its own cost structure, and thus the prices it charges becomes a self-fulfilling growth driver that Amazon refers to as its Flywheel Effect. Facebook also enjoys several important competitive advantages. As easily the world's largest social network, Facebook's massive size and scale make it one of the most important companies in tech and one of the most difficult to disrupt. With 1.79 billion monthly active users as of its most recent earnings, Facebook's ability to reach nearly any demographic at scale makes it impossible for marketers to ignore. This network effect also extends to its user base as well; the nature of its network effects mean Facebook's network becomes more valuable as more users join. Lastly, machine learning and artificial intelligence software need massive data sets to power their learning processes, and few companies possess as large an interconnected trove of personal data as Facebook. From a purely numerical standpoint, Facebook easily wins the valuation showdown against Amazon. Here's a quick snapshot of how several of the most popular valuation metrics break down between these two tech giants. Amazon generates far more cash than its accounting income suggests, which explains the chasm-like disparity between the e-commerce giant's earnings and EBITDA multiples. Digging into its cash flow statement, Amazon generated an impressive $14.6 billion in cash from its operations -- nearly half of which is eaten by non-cash depreciation charges alone -- over its past 12 months, versus $2.1 billion in GAAP profits. This reflects the company's longstanding strategy to reinvest its earnings as aggressively as possible to fuel its long-term growth, which it has done by rapidly growing its fulfillment network over the past decade. Though it uses some long-lived assets like data centers similarly, Facebook's overall business model is far less fixed-asset intensive, which translates into far larger gross margins and higher profit margins for Facebook. As was the case with their balance sheet examinations in this article's first section, the differences in their business models makes comparing the differences in Facebook's and Amazon's valuations an apple-to-oranges exercise. However, at the end of the day, Facebook's greater profits and lower multiples earn it a win in this category. Winning two of the three categories, Facebook earns the title of better buy here. However, more importantly, both Facebook and Amazon are both great stocks to own for long-term tech investors. As the clear leaders in their respective markets, each driven by its own visionary leadership, Amazon and Facebook are indeed both fantastic stocks to buy today.